– Melina Cordero, Americas Head of Retail Research. 2016 holiday retail sales exceeded optimistic expectations. Consumers spent nearly $936 billion on retail and restaurants in November and December—an increase of 4% from the 2015 holiday season, according to the U.S. Census Bureau. This growth was nearly double the 2.2% rise in 2015, reflecting improvements in the U.S. economy, household finances and consumer confidence in 2016. E-commerce was not the sole driver of retail sales growth. 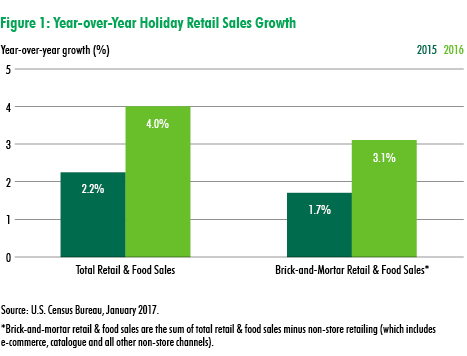 Brick-and-mortar holiday retail & food sales grew 3.1% in 2016—also nearly double the growth rate seen in 2015. Though sales by non-store retailers (comprised primarily of e-commerce sales) did rise more than any other category, significant increases were noted in health & personal care (6.4%) and restaurants & bars (4.2%). Sales at gasoline stations, aided by rising oil prices, also rose 4.9% against 2015. Strong holiday sales were driven by two key factors. First, consumer confidence rebounded in early November after the presidential election was decided. Second, consumers are feeling more confident about the national economy and their personal finances. 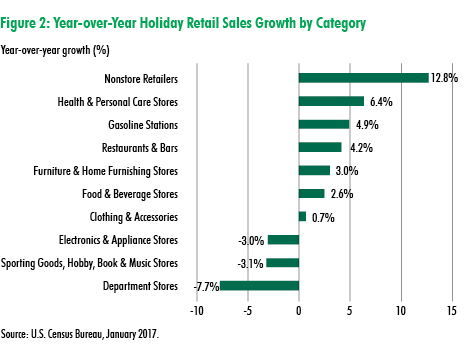 Because household spending is an indicator of both better financial health and anticipated gains, the relatively high level of holiday sales growth suggests spending in the first quarter of 2017 will be healthy.